It has been a while, but I am finally back with a review for the third Slayers series! I enjoyed the first series and then the second upped the ante in just about every way. Slayers Next will likely be remembered as the pinnacle of the Slayers franchise, but there is still more to come. Slayers Try…tries a little too hard to be a mix of Slayers and Slayers Next by adding some powerful threats, but also trying to go back to the days of random adventures like in the first series. It is a mix that backfires quite a bit like GT, but still ends up being a good show. Lina Inverse and her gang of heroic crooks are fairly happy about how their latest victory went. They decided to split up for a while and maybe they would bump into each other at some point in the future. Well, this happens sooner than they may have expected! Aside from Sylphiel, the gang meets up with Zelgadis who is still trying to learn the secret of how to transform himself. He’ll never accomplish this goal, but at least he is still trying. Zelgadis decides to stay with Lina and pals after they meet a mysterious figure who goes by the name, Filia. Filia tells the heroes that they are destined to save the world! Lina refuses, but Filia explains that the heroes are her last hope as all of the best heroes don’t want to do this task. Lina and the gang are forced into accepting the quest under threat of imminent destruction (Lina’s sister is too powerful for them) and they must now….stop this threat. The problem is that they have no idea how to stop the danger that is approaching since the heroes don’t even know what kind of trouble to expect. They only have Filia’s guesses and intuition to guide them! I may as well say that the threat is caused by Overworlder’s (gods) who seek to change the status quo and unleash ultimate darkness across the world! Typically, it only takes me one paragraph to describe the plot, but a lot has happened so two was necessary here. The lack of plot can be a little eerie, but it works into Try’s gameplan. It want to be episodic like the first series, but with serious stakes like the second one. This is still a dicey mix to achieve and I should explain why it doesn’t work out. The classic way to handle this would be to have the episodic parts for the first half and then to throw in a plot. This has worked in many shows like Trigun, Cardfight Vanguard, Digimon Savers, etc. The problem is that Try threw in the plot as early in as episode 1 and then ditches it towards the middle of the show. We get 6-15 filler episodes in the show. All right, let’s not guess here. A quick Wikipedia search tells me that we have 7 “filler” episodes. The quotations are necessary as they technically have canon elements. We have a 2 part episode involving a holy grail weapon, which shows us that dark magic can be destroyed for the first time in the series. 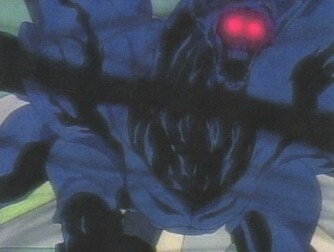 It is what inspires Lina’s final attack on the monster in the final episodes. 2-3 of the other filler episodes involve finding the characters after they failed in the fake climax, but I would still count them. That’s also not counting the episodes that were 15-18 minutes of filler with a plot heavy beginning/ending. So, this really disrupted the pacing. The episodes where the heroes were on the boat were easily the worst ones. Slayers has always been a roller coaster series of ups and downs, but it has typically been more steady than this one. Try’s best episodes rank up there with the best of Next while the worst ones are some of the worst in the franchise. Not really because of anything relating to content, but they simply felt boring and unnecessary. Case in point, the two part episode about getting 2 Kingdoms to make peace with each other. I feel like we’ve seen this plot so many times already and I really didn’t understand what the point of it all was. It destroys whatever tension you had thanks to the villains showing up. Luckily, that’s where the good episodes come into play. For just about the whole series, I was positive that this show was going to get a 6. Then we got the good climax, which made this more of a real battle. The fights in this series could take up a whole episode at times, which was great. The final batch of episodes is really one big fight that keeps on restarting and it is good to see the feats from both the heroes and the villains. There is no shortage of action and excitement in the climax of the series and we also got a nice batch of fights during the middle of the series as well. During these two high points, you would never be able to tell that this was the same series that we had started with. Lina Inverse is the main character and she is once again leading the charges against those who would stand in her way. As a human, Lina is essentially the enemy of all other races so she needs to have a strong personality to combat these threats. Lina has also grown more powerful over the course of these adventures. While she used to not be able to deal any real damage to the big threats, now she has two aces up her sleeve. The Ragna Blade and the Giga Slave. These two attacks have been shown to work on almost any opponent with virtually no exceptions. It likely couldn’t completely KO a Dark Lord (The Blade anyway) but these attacks have allowed Lina to stay on the offensive. Her speed is not increased and I’ll mention that a little more towards the end of the review, but this is still a great improvement. Now, she can back up her tough talk! Lina’s endearing personality is what makes her a great lead. She certainly won’t take any insults from someone without a fight. Whether it is an ally or an enemy, she will quickly unleash her full power. Lina is still not your average hero as she will occasionally blow up villages and mountains by mistake, but she does end up saving the world so hopefully it all balances out. Slayers wouldn’t be nearly as interesting without her in the lead. Gourry is Lina’s partner and he’s always been a very interesting character to watch even if he is very unlikable. It is a bit of a tricky puzzle eh? The first episodes of this show continue to prove why he will never be likable, but at least he does provide the show with a lot of its humor. He never understands the gravity of a situation, but that doesn’t stop him from trying his best. 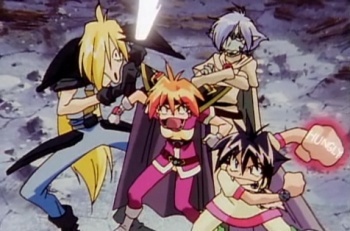 Gourry always has his game face on and with his Sword of Light, he can deal some heavy damage to just about anyone. He did go up against Valgaav after all! He’s about the same from the past two series, which is good. If they made him likable, then that would be even better. Amelia’s role here is certainly smaller than in the first two series. She is still a member of royalty, but she doesn’t get her own adventures this time. She’s simply tagging along for the ride like Zelgadis. She’s still a nice character and she gets her hits in at times. It’s hard to say who the weak link of the team is at this point as it is between her and Zelgadis. It is very close, but she tries her best and fills the team with optimism. They certainly need at least one hero on the team right? Zelgadis continues to lose more and more of his dignity. I’d bet dollars to donuts that the writers for Try did not like him as a character. He is literally used as bait, an anchor, and simply tossed around when it is time for jokes. He may have been a decent character in the original series and almost decent in Next, but now he’s just a really bad character. I find it almost impossible to like him. It is too bad since he gets a lot of scenes that are supposed to make you say “Snap, this guy’s cool!” That is not my reaction to the scenes and I can’t think of a single moment where Zelgadis actually did a critical thing here. Not a single scene……his fans will not be pleased. Filia is the new addition to the group and she ends up replacing Sylphiel. She is a gold dragon and her powers are impressive during her first appearance. As a gold dragon, her speed was so great that none of the main characters could land a hit on her. (An accurate depiction of speed…impossible!) Unfortunately, that’s where the buck stops as she is not really useful against any other opponents for the rest of the series. She evidently has some useful abilities like super strength and her spells, but the enemies are always one step ahead of her. It’s too bad as the exact same thing happened to Sylphiel. As far as personality goes, she has a little Amelia in her. Filia thinks of herself as a bit of a hero so she is always dismayed when the heroes engage in criminal activities. She also does a lot of soul searching as the series goes on because of what her fellow golden dragons did. Perhaps she takes this a little too personally as she had nothing to do with most of their evil deeds. It is regrettable, but she doesn’t need to lose all hope over it. She nearly jeopardizes the final battle as she proved to be indecisive. Her rivalry with Xellos is fun though and while she is no match for him in a fight, perhaps she can defeat him in the battle of burns. (Burns=Insulting an opponent so well that you metaphysically burned them) As far as the main cast goes, it is: Lina>>Amelia>>Filia>>Sylphiel>>Zelgadis>>Gourry>>>>>>>Xellos. So, Filia’s rank isn’t all that bad. She could certainly better, but her personality fits in well with the team and doesn’t get old quite as quickly as Zelgadis’ gimmick. It’s also good to have a little more muscle power on the team. Ah…now it’s time to talk about Xellos. A seriously disliked him from his very first appearance. While he will likely never look quite as bad as in Next, he’s still not my kind of character. For starters, he is constantly betraying the heroes to advance on his own goals. He is a monster through and through so he does remind the heroes that they should never trust him. Just because he makes that clear from the start, doesn’t make it any less sad when he betrays them again. Xellos has physically attacked the team during their scuffles and while he typically holds back so they aren’t very injured, he has come close to destroying the world. The heroes really need to treat him like a total enemy and stop pulling their punches. The sad thing is that Xellos could easily destroy the heroes in an instant if he so desires. He is really just toying with them and that can’t help the egos of the heroes all that much. As a villain, it can be fun to see Xellos act so smug and insult all of the other villains, but I wish that the show would totally keep him on the villain side. It would make him much more bearable. Still, it we’re just talking about this series, he is not that bad. I’ll never consider him as a villain though. How would the rankings change if we just counted this series? I suppose that he would jump over Gourry and Zelgadis. It’s possible that he could also pass Sylphiel, but it would be close. All right, it is time to talk about the best villain in the show. He is also potentially the best character in the series as well. I’m talking about Valgaav! Valgaav is a mix of monster and dragon so his abilities are quite formidable. He is one of the only opponents to be on the winning side against Xellos and he takes on a good portion of the cast at once. That is before the final power up that he gets, which made him virtually unstoppable. He is a villain who had a tragic past and he loves jumping into peril. He’s simply my kind of villain and he acts like other all stars. (Grimmjow comes to mind) All of his fights are interesting and I’m glad that he didn’t decide to listen to Almayce like the average pawn. If Valgaav wanted to do something, then he would just go and do it! He had a nice blend of emotional moments as well as intense ones. Really, when it all boils down to it, Valgaav is probably the best character in the franchise. I thought about it for a bit and there is really no better character. It is a shame since he will likely never appear again, but at least he got a grand role in this series. Thanks to his final power up, you can definitely make the claim that he is the strongest character in the series. The Lord of Nightmares may contest that though. Valgaav got to prove that he was stronger than the other three villains, which is a good enough start for me! Maybe we’ll get a spinoff/prequel about him someday..maybe. (His origin isn’t exactly something that I’m very interested in though so I’d want it to take place right before Try) Valgaav also gave us the very first, big fight of Try so his debut was a very memorable one. 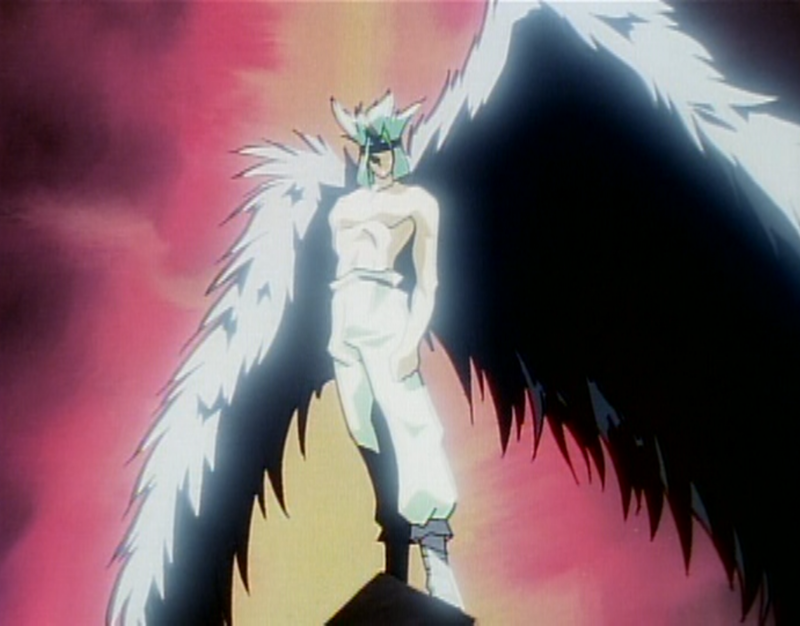 Almayce is the big villain for most of the series, but it is safe to say that he overestimated his power. He’s actually weaker than the other three big villains of the series although it seems like he could potentially still defeat Xellos. So, maybe he also outranks two of the other opponents, but it is hard to say. His design is great and he looked like a very menacing villain for a while. The problem is that he doesn’t know where he stands. On one hand, he is certainly a villain as he is constantly hurting people and endangering lives. On the other hand, he is trying to save the planet while getting rid of Dark Star…..I’ll just count him as a villain. Because he is constantly switching sides, Almayce loses sight of what is happening and that’s when the villains make their move. Almayce went down rather easily even though he should have been expecting someone to destroy him. He was causing trouble for both the heroes and the other villains. It would have been cool to have seen him fight more, but he still made for a fun boss to oppose the heroes. Erulogs joins the fray towards the end of the series along with Sirius. It was odd to see him join in as the series was already heading to a close, but the more villains the better right? I liked him more than Sirius, less than Valgaav, and slightly more than Almayce. His abilities were very impressive as the heroes could not hold a candle to his power. He felt like the average DBZ villain and that is always a good thing. It is too bad that he didn’t get more of a role. It was still bigger than the role of Sirius though. Sirius is the more rational of the two villains and he wants to learn as much as he can. He also doesn’t mind sparing the Earth as long as it won’t hurt his chances of survival. He is a villain that the heroes can work with and his abilities are still impressive. He doesn’t seem to be as tough as Erulogs, but he is still tough enough to keep the heroes back. While his design was not too good, his personality made him a decent villain. It is worth mentioning the Dragon King Elder because he is so terrible that it becomes laughable towards the end. Not literally as this guy did single handily bring two different species of dragons to their extinction. (Filia may be the only dragon in existence anymore. Certainly the only Gold one left and the ancient ones are gone as well) The Elder wants the gold dragons to rule over all, but his life comes first and foremost. He is defiant to the end as he dies while explaining that he regrets nothing and he would do it all over again. He betrays his heroes to the villains and doesn’t seem to have a whole lot of common sense. It is regrettable that he became the leader of the Golden Dragons since he definitely did not have their best interests at heart. Dark Star is the big villain for this series and he lives up to the hype. It is always fun to meet another Dark Lord from the tree of power. Shabranigdo is still the most impressive beast, but Dark Star is no slouch in the power department. Simply by flapping his wings, he can bring the heroes to the verge of death and he can shoot a variety of energy blasts. Dark Star’s flight speed is incredible and he’s a known planet destroyer. Everything about this villain is cool and hie design is actually like the symbiote from Marvel. At least the face resembles Venom. Dark Star is virtually unstoppable and his only weakness are the legendary weapons of light. Without them, you can essentially confirm the destruction of your planet. Spells don’t hurt him because Dark Star’s soul is in another plane of existence so physical attacks are the only way to challenge him. Dark Star made for a great end boss to the series and he’s probably the second best monster villain behind Shabranigdo. Aside from the serious villains, we also got some low ranking ones to mention. Jillas was mostly played for laughs, but he actually got a serious subplot towards and the end and it hit you right in the feels. (Feels=Emotions. So, if something hits you in the feels, it’s like metaphysically hitting your sad or happy emotion and triggering that feeling inside of you. That’s how I’ve always thought of it anyway.) He has to leave his family at the end to help defend the planet and he also decides to finally move away from his thoughts of revenge. While most of the characters in the series have magical abilities, Jillas is stuck with his sheer intelligence. He is good at making bombs, but that certainly won’t carry him very far against the kinds of villains that are present here. He was fairly likable though at times and he was much better than his partner. Gravos is an ogre type of demon and he never becomes likable. The writers don’t even try to make him sympathetic aside from an incredibly brief origin story. He means well I suppose as he is just following orders, but he isn’t nearly as interesting as Jillas. At least Jillas has his motivations and desires to keep him going, but Gravos is more of a two dimensional villain. There’s nothing wrong with that, but it doesn’t exactly help me like his character either. While the series is typically very light toned, there are a few moments of violence that clash with the rest of the series. The battle between Xellos and Valgaav was pretty brutal and likewise for the origin stories of Jillas and Gravos. This happened in the previous two Slayers series as well as everything would be very chipper until a sudden violent scene makes you take a double look. It’s nothing over the top though and it is typically quick so you don’t need to dwell on it, but the violence is certainly around. The dragons get extinct…twice, and they certainly don’t go down without a fight. Xellos vs Valgaav is still the one that will stick out the most simply because the show still plays Xellos off as a hero of sorts and this is certainly not heroic behavior. He is a monster and he is technically a villain, but the heroes barely treat him as such. It is also about time for me to quickly address the plot hax that is present here. Now, this is a problem is virtually all forms of media and in almost all titles. Still, the plot hax is especially prevalent here as Lina and her friends are a group of humans who are trying to stop extremely powerful forces. No matter how many great spells they get like the Ragna Blade, there is no way that Lina and friends should last a minute against such powerful foes. Almost all of the high level monsters and gods are shown to move at hyper speeds. Lina is still a human and can’t run much faster than a normal one. At most, she is Captain America level in speed and power. She should still get speedblitzed at the beginning of every match. The Slayers verse seems to place a lot of emphasis on physical power and none on speed, which is a little misguided. Raw power does not matter if you cannot hit the opponent and that’s my main problem with the title. Lina should be way too slow for any of her attacks to be useful here and she still manages to get in some good hits at times. It’s just a little odd and certainly unbelievable, but it is simply the route that the show has gone. Perhaps the writers feel that Lina and her pals would be less relatable if they had special powers aside from their spells. It’s their choice I suppose. The animation is a step down from Next, but it still looks good. I’m assuming that the budget was likely reduced, but the series still has enough juice in it for some epic action scenes. The rest of the series is just a little more pale and dated than the vibrantly colorful Next. The fights are the important part though and the long action scenes are as good as you could have hoped for here. The heroes give it their all now that they can finally fight a little more: Gourry with his improved Sword of Light mastery, Lina with her Ragna Blade, Zelgadis with his sword, etc. There’s not much to say about the soundtrack since it is the same as in the previous two shows. As for the theme song, it is all right, but it could be better. It is just not as exciting and moving as it could have been, but it is not a bad theme song either. Perhaps the end themes of the Slayers movies have simply spoiled me as they would certainly work better as a theme song than what we got here. The theme song is also a little misleading. As the overall soundtrack has not changed, Slayers Try sounds just as good as the first two installments. 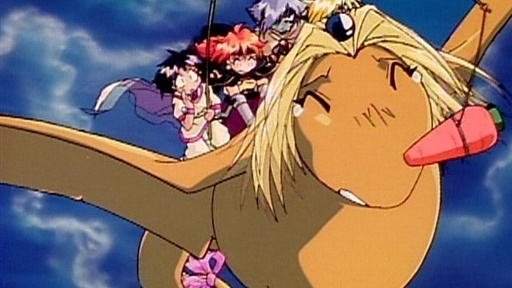 Overall, Slayers Try is a good series. I was hesitant to give it the full 7 as it did have its share of issues with the pacing and just not being quite as fun as the first two series, but it comes very close to reaching that mark. The soundtrack has not changed and the animation has only dipped a little. The main team of Lina and Gourry is still one of the driving forces of the show. The ending certainly feels like it could have been the end of the franchise, but it still would have been a sad one as I disagreed with Gourry’s decision. We got to meet some more powerful beasts from the Slayers verse and I look forward to eventually seeing an ultimate confrontation between the humans, dragons, monsters, and gods. My money is certainly on the monsters, but it would be a good fight. The balance between humor and action can be awkward, especially when mixed. Xellos being defeated by a song towards the end was a little random, but I’ll assume that he is just trolling as per usual. Jumping from serious moments to comedy ones is a delicate art that is hard to master. Slayers Next probably did the best job, but Slayers Try gave it a fair effort. I recommend checking this series out if you want a good fantasy title and while you don’t need to watch the first two series first, I would still recommend doing so. At least, Slayers Next, since one of the main villains wants to destroy the heroes because of what happened there. This entry was posted in 6 Star TV Shows, Reviews, TV Show Reviews, TV Shows and tagged Action, Amelia, Anime, Anime Review, Cartoon, Demons, Dragons, Fantasy, Filia, Gourry, Lina Inverse, Monsters, Review, Slayers, Slayers TRY, TV Show Review, Xellos, Zelgadis by dreager1. Bookmark the permalink. Yeah, that’s true, he’s definitely got a lot of personality. His aggressive fighting style is definitely why I was a fan though. This guy really knows how to fight! And why Valgarv never hates Filia, the same Golden Dragon as Supreme Elder ? Because he thinks that Supreme Elders and their races tends to hurt and blame Filia (and maybe Bazzard Ul Copt, her (adoptive, as I assume) fathter. I think they even killed her father with some tricky way) more than him, and he also thinks that Filia is really lonely all of her life, even Lina and others doesn’t being nice to her. Yeahh!!! How about Ulquiorra and Ichigo ? I’m definitely a big fan of those two characters as well. Bleach had a really dynamite cast to be honest! Jillas shows his kindness more to Filia, because he heards from Valgarv that her friends and maybe her races (which is her most internal conflict) doesn’t treat her kind and he gets angry when Lina mock Jillas for saying an animal, because he thinks that Filia also gets same treat as he does (but technically it’s Xellos who mocks her, because she (who’s innocent) afraid of him (I assume that when she sees mazoku, she thinks that mazoku tries to kill her and (maybe) her father) and calls him “garbadge”.